I hope you have read our previous post on How to Play Basketball game in Facebook Messenger App. If not then you should read this. Today I am going to share How you can play chess game on messenger App. 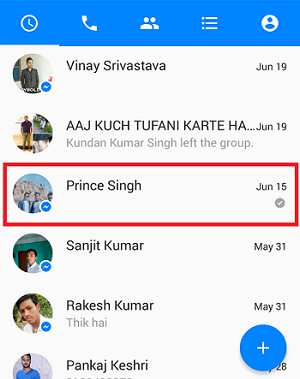 Well, Messenger App is the best app for chatting with friends on Facebook. Messenger app is provided by Facebook Officially. I hope you have already installed Messenger App in your Smartphone. Time to time Facebook update his features to engage its visitors. 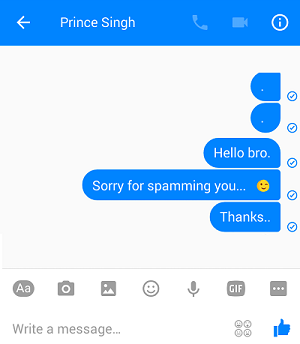 So Facebook started new features to Play chess with Facebook friend Online on Messenger App. 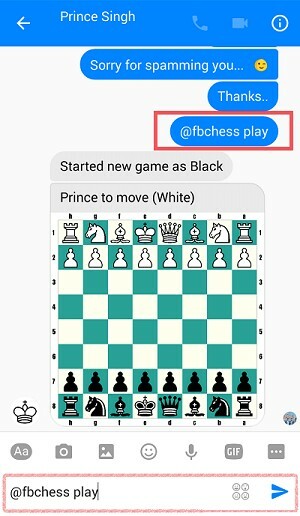 If you really interested in playing chess with FB friend then follow below instruction to Play. Firstly Update your Messenger App if not updated. [REQUIRED]. If you have any problem in Updating Messenger App from Google Play Store then Direct Download Play Store Apps from PC or Browser and then install manually. Type @fbchess play and send it to any friend. Wait for 4-5 sec. and you will get the chess board on the messenger app. Now lets Play with your friend. I got Black color and my friend (Prince Singh) got White color to play chess. Actually, White color is required to first turn. So Prince Singh got First turn to Start the game. If you want to change the color of your chess game then simply type @fbchess play black or @fbchess play white. Need help for chess game from messenger App ?? Type @fbchess help and send.